Summary template. Please send it via email until March 15 March 21. 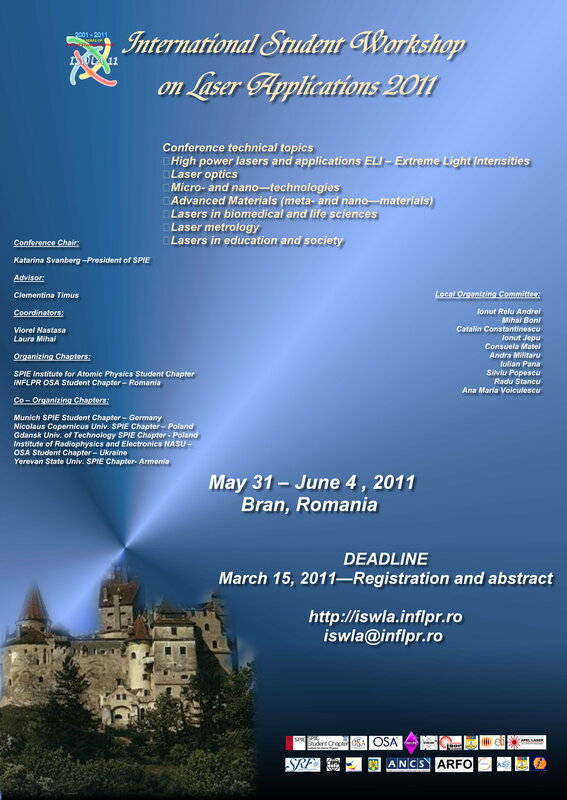 Please complete and submit the registration form bellow or download it and send it to iswla@inflpr.ro. After April 1st - 75 Euro for OSA and SPIE student chapter members or 100 Euros - non SPIE / OSA members. Conference fee includes the participation to all conference sessions, abstracts booklet and program, social activities. Registration will be confirmed by e-mail at the registrant's address upon reception of this form and the payment. Remember to specify "for ISWLA'11". Direct cash payments will be also accepted at the conference desk. State the name of the participant and the issue clearly on the payment. Bank transfer must be free of charges for the recipient. All bank charges are the responsibility of the sender. Both oral and poster presentations are accepted. Authors are kindly requested to submit one page summary untill March 15 March 21, 2011. You can find a summary template here.